The management of Namboole Stadium has granted permission to Bobi Wine to host his Kyarenga concert next month. This is contrary to earlier announcement by Uganda Police. 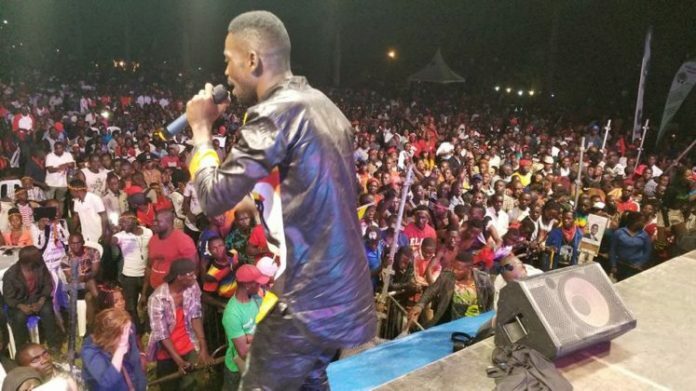 A letter authored by Assistant Inspector General of Police, Assuman Mugyenyi addressed to events promoter Emma Serugo of Emma Promotionz and Marketing Agency – the organisers of Bobi Wine’s Kyarenga Album Launch revealed that Namboole Stadium was booked out till January 2019. The latest, the date of the concert has been pushed to 9th November if the musical promoters fulfills certain conditions. Among the conditions, the promoters have been asked to get police clearance that confirms that the event is allowed by the security agency. “You are requested to make full payment for the venue charges to confirm your booking by 29th October,” reads part of the letter. 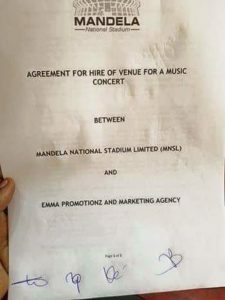 In the agreement, Namboole stadium and Emma promotions have agreed to hire out the venue at a tune of Ugx. 32,000,000 payable before the concert. Other terms: revelers shall not be allowed on the turf since the national team will be playing a match in the subsequent days. The manager directed Emma promotions to fulfill the requirements within two days. “If the above conditions and terms plus those in the contract are acceptable to you, please sign and return at earliest but not later than two days,” the letters reads in part.